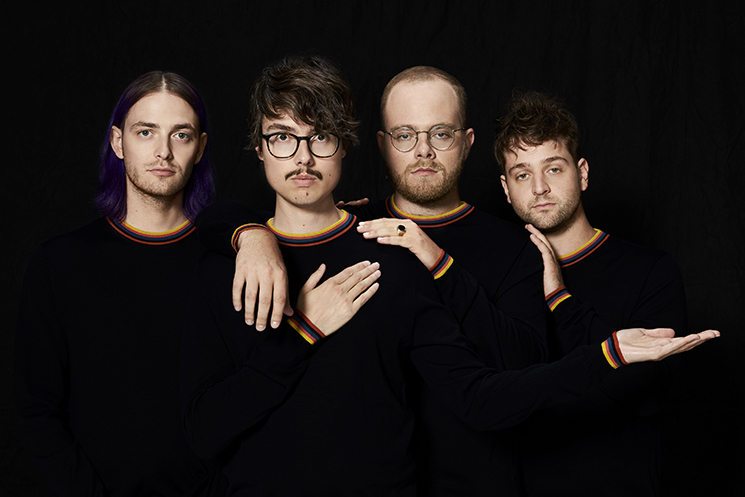 Makers of sparkling synth-driven hits such as “Tongues” and “Destruction,” Joywave are no strangers to either the dance floor or the top of the alternative radio charts. Following up on 2015's How Do You Feel Now?—a brisk exercise in electro bliss and eye-winking lyrical themes—the band is back with Content, their second long-player that cuts an edge into their sound without losing their dance-friendly face. Recorded in a barn, the album is an eclectic beast, packed full of buoyant pop (“It’s A Trip!”), angsty electro-rock jams (“Little Lies You’re Told”), and meditative interludes (“Let’s Talk About Feelings”). In short, the Rochester, NY four-piece owns a bag of tricks as wide as it is deep. If you can’t find them on a dancefloor, look out for Joywave when they play a venue near you. Currently on tour with Cold War Kids and Young The Giant, the band will be touching down on a host of cities throughout the fall. As they set off on the road, we got frontman Daniel Armbruster on the phone to chat about life on a tour bus, in a barn, and on a jet ski. Your new album title, Content, could be read as both an adjective and noun. How do you personally read it? I personally read it as content, an adjective, because it’s a very personal record. It came after the first really long record cycle, and it’s supposed to be a reaction to that. You also spent four months recording the album in a barn. How do you think that influenced the band’s songwriting? It’s a location that we just found on Airbnb, like a barn that got turned into a house basically. We just wanted something big and open for recording, and we took all of our equipment from our studio in downtown Brooklyn and moved in there. It definitely influenced our sound, yes. The first record, we recorded it downtown and we were able to go out everyday, but for this record there wasn’t really anything around, so we really got to lock in and section ourselves off. You’ve just headed out on tour as well. What are some essentials you’ve packed? Well, I have a five-port USB charger, several lightning cables, an iPad, headphones, laptop and a really good medicine bag with plenty of vitamins. I think that’s it, although a change of clothes would also be a good idea! Which of the songs off Content are you especially excited to road test on this tour? I’m excited to play “Thanks. Thanks For Coming”, which we haven’t yet, just because we’ve only had half hour sets so far. But I’m really looking forward to testing that one out. What's an essential song on your tour bus playlist? I think one of the songs that gets played the most is “Mexicans” by Kane West, not to be confused with Kanye West. It’s really just a funny, pumped-up song that reminds us not to take life too seriously. “It’s a Trip!” is such a great single with an equally amazing video. Was it as fun to make as it was for us to watch? I would say it was probably more fun to watch than it was to make because we had to sit for hours in makeup. I do not envy the actors who are on Hollywood blockbuster film sets. It was itchy and uncomfortable, but I’m glad I got to experience it for one day so I know I don’t want to do that again. And I’d never rode a jet ski before so it was actually kind of scary, but we got through it. Did you enjoy watching yourself age cosmetically? Yes, absolutely! It’s great. It’s just like touring… except on jet skis. And finally, what would make for your perfect trip? I like to go places where people can’t find me, but not necessarily like in nature—just places that are off the beaten path. Good coffee and good food are requirements, and if I can catch a hockey game wherever I’m going, that’ll be the bomb.